The HP15c is in my opinion the best pocket calculator that was ever made. It might not be the one with the most functionality and it might not be the fastest but it was well designed. It can do everything one needs to do with a pocket calculator, it has an excellent keyboard and a good size. I would like to investigate the battery and power consumption problem a bit. The big spike: 20mA current draw at button press. The hp15-le runs with 2x CR2032 batteries that are connected in parallel. An oscilloscope shows a bit under 2mA current consumption at normal operation and 20mA at button press. The spike at button press is normally about 100ms long but if you hold the button then the calculator will consume 20mA as long as you hold the button. That mean we load each CR2032 with 10mA at button press. That is a rather heavy load for such a coin cell. Now is that a hardware fault or a software problem? The hp15-le has a self test mode and you enter it by holding the g and enter keys and then press on. The display shows 1.L2.C3.H and then you can press 1 or 2 or 3 to test different parts. No spike while pressing a button during the self test. The average power consumption is 2-4mA. It's interesting that there are no spikes in the power consumption when button are pressed while executing the self test. Not even when running the keyboard self test. To me that indicates that the 20mA at button press is really a software fault. It seems the AT91SAM7L128 Atmel ARM processor that HP used for this machine is not properly going back to its sleep state when a button press event was detected and it's looping until the button is released. Now what is wrong with the low battery indicator? I have read various speculations about the way it works. Some say that the battery status is only checked every 50 buttons press events and the CR2032 might loose at the end of its life the capacity rather quickly. The 15C-le should show a "*" in the display at low battery. Let's connect it to a regulated lab power supply and then see how it behaves. 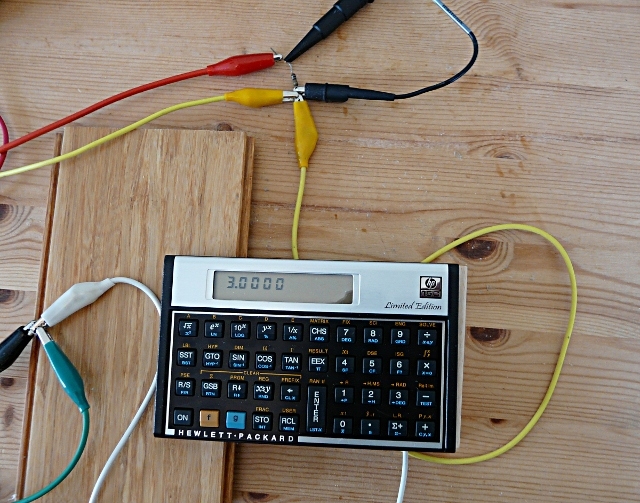 Empty battery simulation with a regulated lab power supply. I took out the batteries on the back and used small crocodile clamps to connect the power supply. The hp15c-le shuts off if the supply voltage is only at 2.0V and one presses a button. It resets itself then and when you turn it on again at a higher voltage it will display an error indicating that it has lost its data. Therefore let's try 2.1V. It seems to be able to still function at that voltage. I have let it run for an hour at that supply voltage and I have pressed all kind of buttons more that 100 times. The low battery indicator will never every show up in the display. The low battery status indicator functionality is either not implemented at all or totally faulty. It does not work at all. The hp15c-le is still a nice calculator but it has not been built with the same quality and passion and testing that went into the original HP15c. There are microcontrollers for which Atmel promises 100 years data retention on the flash memory that holds the firmware but for the AT91SAM7L128 that is used in side the hp15c-le they promise only 10 years. It's not sure that the hp15c-le will see it's 30th anniversary. My original HP15C is however still working and it might still be good at it's 60th anniversary. To be fair I should however mention that all of the CPUs for calculators produced today are based on a similar flash firmware storage technology with an expected life of 10 years. Maybe they will last 20 years but not much longer. I would like to see a company that produces again a real hp15c. A calculator known for it's quality, functionality and ergonomics. http://www.swissmicros.com/ started to do that but the keyboard is rather small (the whole calculator is too small) and the keyboard is not nearly as good as the one from the hp15c or the hp15c-le. http://tuxgraphics.org/~guido/hp_calc/, my HP calculator page. http://www.finetune.co.jp/~lyuka/interests/calc/hp15cle/, a partial fix for the high power spike problem: add a 100uF ceramic capacitor in parallel to the batteries (requires opening of the case). Note: this extra capacitor may extend the battery life but the low battery indicator will still not work. The calculator will simply shut off at low power and show "Pr Error" at the next power-on. All programs and registers will be lost.